CAROL GREENE, SINGING VENTRILOQUIST, lives in the Santa Cruz Mountains above Los Gatos, California. She is a very versatile family entertainer who has performed in a wide variety of venues. Internationally she has performed in China (2001), Mexico, Japan (2004), and Belize (2006). She performed in Las Vegas annually for every Vegas Ventriloquist Festival, and presented her workshop called "Singing For Real Dummies" (2005). 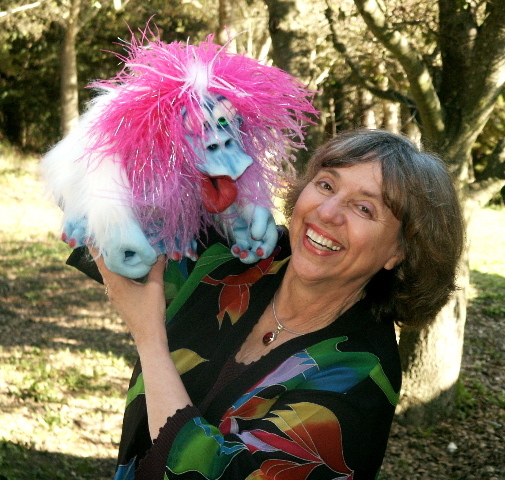 As a skilled workshop presenter and ventriloquist coach, she has instructed over 4,000 adults and children in ventriloquism basics. She composes songs specifically for her puppets, and she enjoys using them to chat informally with party guests during walk-arounds. She aspires to be different, and creates programs especially for some venues. In July, 2005, three puppets and she conducted the complete Sunday morning worship service for Los Gatos Methodist Church. For her accomplishments in the arts, she received an achievement award by the National League of American Pen Women. Among her TV appearances, she appeared on The Discovery Channel with Sammy, her late 1920's Frank Marshall figure; The Today Show in a story covered by Candace Bergen; and Bay Area TV Shows. All site contents copyright 1996-2006 Carol Greene except for articles published about me in other publications.